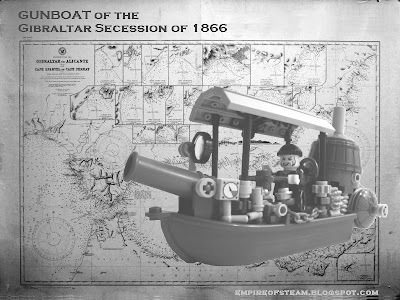 The Gibraltar Incident of 1866 saw the Secessionists employ small, highly-maneuverable Steam Gunboats to considerable effect, harrassing Imperial merchant shipping through the Straits. Although manned by only one sailor, the Gunboats were armed with the equivalent of a small frigate's weaponry and proved to be much sterner opposition than had been expected by Imperial Naval Command. Twenty-three of these small craft formed the Secessionist Fleet, carrying out hit-and-run raids on Imperial craft over a period of six months, across the Western Mediterranean and occasionally in the Atlantic approaches to Gibraltar. The gutter press of the time was in uproar at the apparent inability of the Empire to defend her shipping from such "insignificant" enemies, and the successes of the Gibraltarian vessels, whilst small in scale, became a major embarrasment to the Government. The Prime Minister, Lord Stanley, was questioned by an angry Commons, and at one point it seemed that the issue might force an early General Election. The Secessionists were only brought to heel through the dispatch of four pocket battleships to the region. These vessels, most notably the famous HMS Pollyanna, hunted down the Gunboats at sea, and crippled their onshore support facilities with heavy bombardment of The Rock. The final crushing of the Gibraltar Secessionists came too late for the hapless Prime Minister. Although no General Election was called, the Tories felt Stanley could not continue to lead his party and he stepped aside, allowing Disraeli to take the helm. Further photographic images of the Steam Gunboat may be viewed here.